Lilly ponds are very popular. They are a nice place to sit and reflect, especially if there is a water fall or raceway. Nothing helps one settle down and think like a gentle waterfall. You can already hear the gurgle of the water. Now for a harsh bit of reality: installing a Lilly Pond is a lot of work. Make sure you have plenty of help lined up to excavate your dream pond or you will get lots of what my Dad called "character building" exercise. 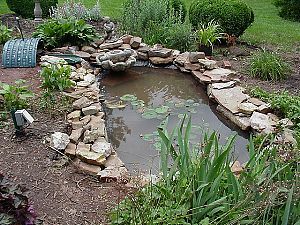 When planning your lilly pond make sure you set aside about $250 to get things rolling. Expensive fish aren't necessary immediately but the liner and pump are. It's a good idea to put the plants in about a week before you put any fish into the pond. Besure that power is GFC protected. Pond liner can be very slippery - Don't fall!